European football fans will seldom need reminding of the incident in the Champions League tie between Swiss League champions FC Basel and Schalke 04 of Germany’s Bundesliga early in October. Only a few minutes old, the Group E clash was dramatically interrupted by several protestors from the international, environmental activist group, Greenpeace. Abseiling from the roof of the St Jakob-Park stadium, the protesters unveiled a large, yellow banner emblazoned with the words “Gazprom, don’t foul the Arctic” and “Free the Arctic 30.” Shocked players, officials and fans watched on from the pitch and seats below as the Greenpeace activists dangled in the night sky, their message illuminated by the bright floodlights of the stadium. The game was halted for around five minutes before the activists ascended back onto the stadium roof, disappearing into the night. It was a short but bold protest against the Russia’s state-owned energy giant and Champions League sponsors, Gazprom and one that shows the intertwining relationship between football, politics and business. It was almost the perfect protest. In front UEFA president, Michel Platini who was there watching the game. On Swiss soil in FIFA’s back yard. 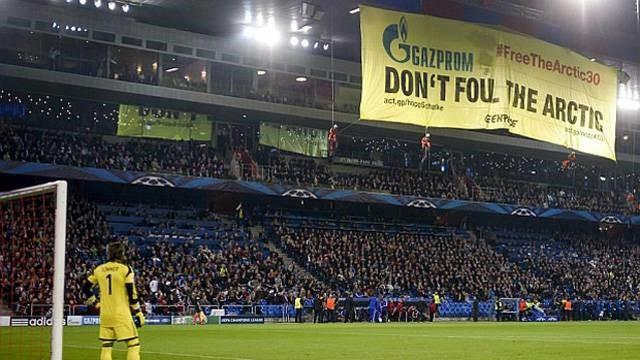 During a Champions League match, a competition sponsored by Gazprom. A game involving Schalke, who are also sponsored by Gazprom. Football had provided the perfect, public platform to stage such demonstration. The sheer audacity of the Greenpeace protest was in itself an impressive feat, but in football terms; I see it not just as an environmental demonstration but also as a proverbial “slap in the face” to the corporate giants that own modern football. Having said this, it’s important not to understate the more important issues which the protest was seeking to address. In September, a month before the protest in Switzerland, 30 Greenpeace activists were remanded in custody after being detained by the Russian authorities. Their ship, the Arctic Sunrise had been sailing in the Barents Sea near Gazprom’s Prirazlomnaya oil rig when they were detained by the Russian coast guard. The main concern for Greenpeace was that the incessant pillaging of the Arctic regions natural resources could cause even further, irreparable damage to an already fragile environment, especially if there was an oil spill similar to that by British Petroleum off the Gulf of Mexico. Russia’s oil industry was one of the main culprits for mining in the Arctic. Although billed as a peaceful demonstration, two of the Greenpeace activists tried to board the oil rig and thus the whole crew were detained as the Russian coastguard towed their ship to the nearby port of Kola Bay in Murmansk. 14 members of the group were subsequently charged with “piracy of an organised group,” which carries a penalty of 15 years in prison. Needless to say the charges brought against the 14 individuals, some of which are simply freelance photographers and video makers have outraged many people and not just those in the Greenpeace community. Eleven Nobel Peace Prize winners have voiced their support for the group in recent weeks. Gazprom’s Prirazlomnaya project is scheduled to actually begin production by the end of 2013 and it is believed that Russia’s continued economic growth is highly dependent on the income from oil and natural gas production. The arctic territory, to which Russia has a large claim, is rich in both of these fossil fuels and Gazprom are looking to capitalise on the arctic’s natural deposits in the future. With Gazprom’s business holding such economic importance, you can see exactly why the Russian authorities are so protective over the mining projects near their shores. However, on the other hand, you can also sympathise with the Greenpeace cause for concern, especially when you consider the strong-arm reaction of the Russian authorities to 30 peaceful protestors. The situation in Russia had all unfolded in late September and by the time the first Champions League games of early October came around very little had changed. But the tie between Basel and Schalke provided Greenpeace with the perfect stage to bring their fight further into the public eye. The game itself was a closely contested affair between two young and competitive sides and it was only a wonder strike from Schalke’s Julian Draxler that separated the two teams. Yet another German attacking midfielder created by the Bundesliga production line, Draxler, loitered on the edge of the Basel penalty area and took his chance from a poorly cleared corner, rippling the inside netting with a wonderfully struck half-volley from 25-yards. However, the obvious noteworthy event of the game was the Greenpeace protest. UEFA gave Basel a cold response, launching disciplinary proceedings immediately and have since seen fit to fine the Swiss club €30000 for the incident citing “insufficient organisation.” The club themselves are also considering whether to take legal action against Greenpeace. However, in my opinion Basel shouldn’t take this course of action, if only for the sake of a moral victory. Football has become increasingly corporate over the years and a company name can usually be found preceding the title of most professional competitions, much to the dismay of the football purist’s. Gazprom is no different and has been increasing its involvement in the game since 2007. Firstly as Schalke’s shirt sponsor, then as the main Champions League sponsor in 2012 (not to mention the Serbian SuperLiga and Red Star Belgrade) and is now set to become one of FIFA’s major partners in 2015. The growth of corporate influence is detrimental to the game of football in my view. Whilst the increase in funding may have some positive effects, it is a complete trade-off. With deeper financial involvement often comes inflated influence over decision makers as we have seen at many individual football clubs across the globe. And when you consider FIFA’s already questionable reputation after the debacle which ensued after awarding the 2022 World Cup to Qatar, the prospect of a corporation like Gazprom holding sway over the sports worldwide governing body is far from an enticing one. The last thing football needs is more non-football people making the decisions. The Greenpeace demonstration in Basel, whilst not motivated by football reasons has brought wider social and political issues to the forefront of people’s consciousness. In an age where Corporate Social Responsibility is a high priority, the protest has shown the football world that those faceless corporations are not so responsible. Face value is often deceptive and those who sponsor the game we so love are not all that their PR teams portray them to be.